NEW YORK (March 18, 2016)  Award-winning actress Jennifer Garner recalled her marching band experience during an interview on the March 17 episode of Late Night with Seth Meyers, even explaining the importance of proper heel-toe roll marching technique. A video of the interview can now be viewed on YouTube. Garner played alto saxophone while a student at John Adams Junior High School in Charleston, W.Va. 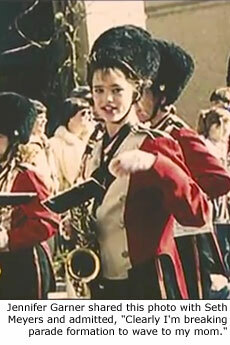 The 43-year-old actress displayed clear memories of her time in band while talking with Meyers. "You don't want to jostle your instrument," Garner said. "You have to go a smooth heel-toe, you want a steady gait, you want to key off of the person to your right because you want a straight line." According to IMDb.com, Garner has received four Emmy nominations, four Golden Globe nominations (one win, for "Best Performance by an Actress in a Television Series - Drama"), and two Screen Actors Guild Award nominations (one win, for "Outstanding Performance by a Female Actor in a Drama Series").